•	Break out those ugly sweaters and join us on Saturday, December 1 at 9:00 am for a holiday hustle down Route One in Falmouth. This year, we are featuring both a 5K and a 1 mile fun run so there’s something for everyone. 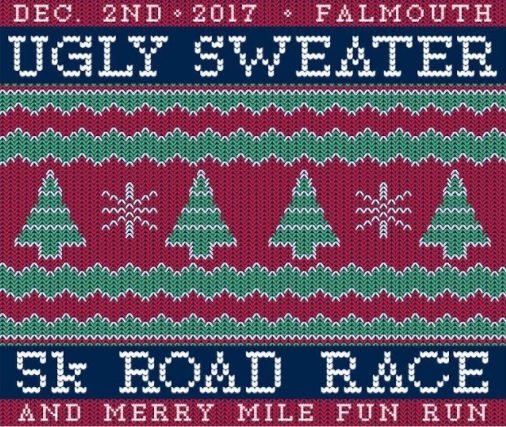 The Ugly Sweater 5K and Merry Fun Run / Walk are part of the Very Merry Falmouth weekend celebration with many events on Friday and Saturday. The proceeds benefit the Falmouth Memorial Library. The 5K and the Merry Mile start at 9 AM. •	The venue is located on the green space near Shaw's Supermarket next to Route 1. The start and finish lines are next to the green space. •	Parking will be available in the outer lots next to Route 1 keeping spaces available closer to Shaw's for their customers. •	Directions – The green space at Shaw's on Rt 1 is near the intersection with Depot Road. Those coming from outside Falmouth can take exit 10 of Rt 295. •	Registration fee includes t-shirt if one registers before November 15. The fee is $30.00. Walkers are strongly discouraged from entering this event. The Merry Mile is intended for any walkers. •	Course – Rt 1 south to Rt 88. 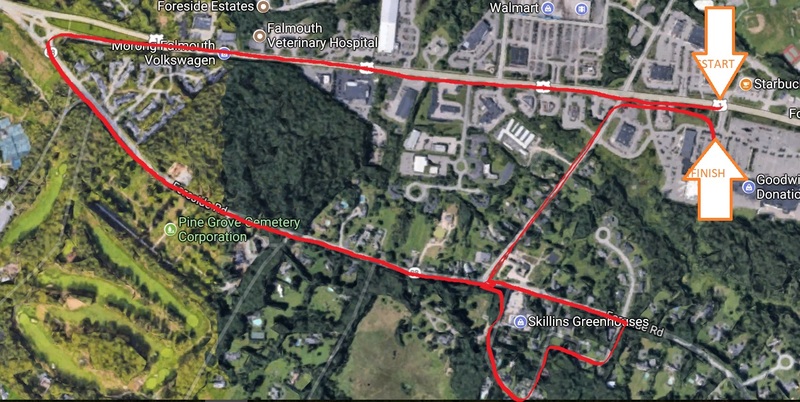 North to Old Mill, turn right, left on to Edgewater, right on to Anderson, left on to Ridgeway, left on to Rt 88, right on to Depot, right on to pedestrian way along Rt 1, right on to Shaw's entrance to finish line. •	Awards – First place male and female plus first place of each 10 year age group; 5K runners with Ugly Sweaters also eligible for first, second or third place awards for ugliest sweater. •	T-Shirts are available to runners who sign up by November 15. For safety reasons the police have asked me to notify runners that strollers will not be allowed in the 5K. They are welcome to join the Merry Mile which is on the pedestrian way. •	Registration fee is $15 for an individual and $50 for a family. Registration fee includes t-shirt if one registers before November 15. Runners and walkers will not be timed. This is an event to show off one’s ugly sweater and parade along Rt 1. •	Awards – First, second and third place awards will be given to the ugliest sweaters as voted by participants.